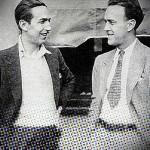 Currently viewing the tag: "Disney"
In 1928, Walt Disney and Ub Iwerks created a little cartoon mouse. They both really liked him. Others working at the studio at the time also liked him, using words like “swell,” and “the bee’s knees,” and “spiffy” to describe him.